The trouble with the stunning vistas of nature is that they're rarely projected on small, moodily-lit, containable screens for comfortable viewing. This leads to a lot of neck straining . 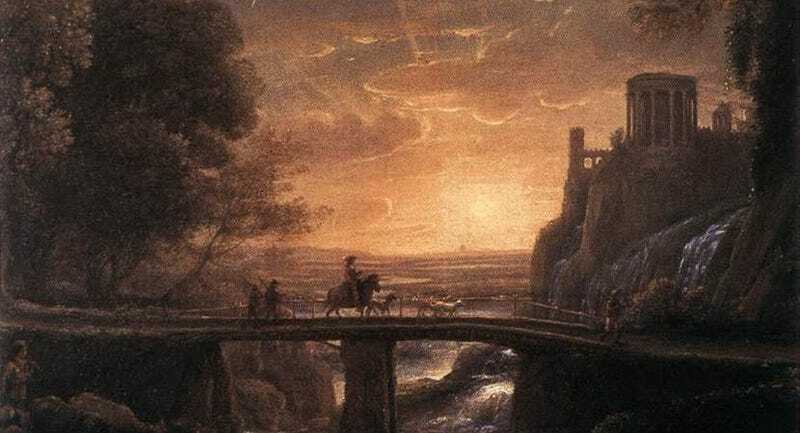 It also led to the popularity of Claude Lorrain, a 17th century painter who painted landscapes in a relatively restrained color palette; people adored his work, which led to frustration when life didn't seem to imitate art. To remedy this, along came the Claude Glass. It was a small convex mirror in a foldable case that could be carried around in someone's pocket. Also called a "dark mirror," it was tinted so that it reflected a scene in shades of gold and gray. To see your beautiful view, all you had to do was turn your back to it, and aim the mirror. The convex surface gave you a wide view and the dark glass filtered out those unpleasant light blues and reds that detracted from the beauty of the scene. At last, nature could be seen the way it wanted to look, if nature had had the benefit of being a 17th century painter! It's true, some artists did, and still do, use the glass to help them get a sense of the tonal values of the setting, but for the most part, the glass was for people who felt that life hadn't spent enough time imitating art. You can learn how to make your own Claude Glass here.